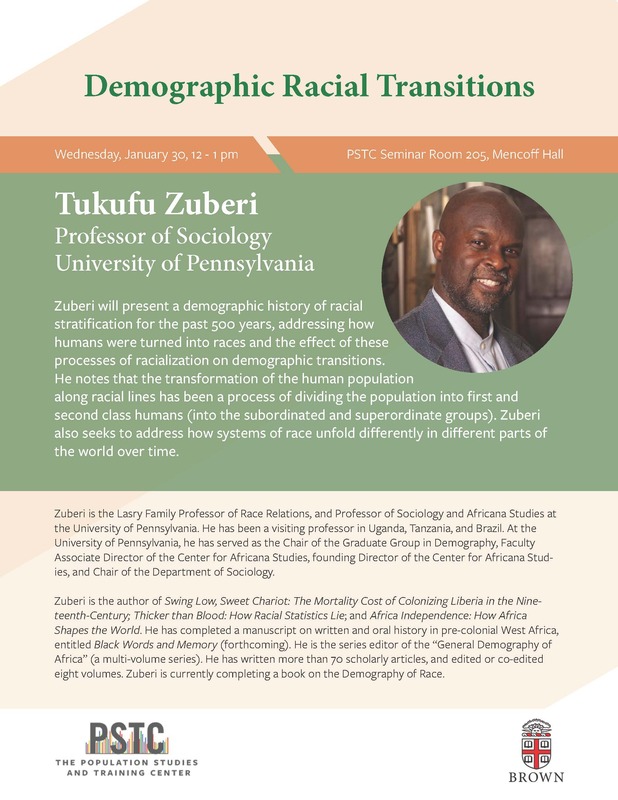 Zuberi will present a demographic history of racial stratification for the past 500 years, addressing how humans were turned into races and the effect of these processes of racialization on demographic transitions. He notes that the transformation of the human population along racial lines has been a process of dividing the population into first and second class humans (into the subordinated and superordinate groups). Zuberi also seeks to address how systems of race unfold differently in different parts of the world over time. Zuberi is the Lasry Family Professor of Race Relations and Professor of Sociology and Africana Studies at the University of Pennsylvania. He has been a visiting professor in Uganda, Tanzania, and Brazil. At the University of Pennsylvania, he has served as the Chair of the Graduate Group in Demography, Faculty Associate Director of the Center for Africana Studies, founding Director of the Center for Africana Studies, and Chair of the Department of Sociology. Zuberi is the author of Swing Low, Sweet Chariot: The Mortality Cost of Colonizing Liberia in the Nineteenth-Century; Thicker than Blood: How Racial Statistics Lie; and Africa Independence: How Africa Shapes the World. He has completed a manuscript on written and oral history in pre-colonial West Africa, entitled Black Words and Memory (forthcoming). He is the series editor of the “General Demography of Africa” (a multi-volume series). He has written more than 70 scholarly articles, and edited or co-edited eight volumes. Zuberi is currently completing a book on the demography of race.